From the "Vision Books" series, this is the story of the girl to whom the Blessed Virgin appeared as "a little young lady" and revealed herself as the Immaculate Conception.Bernadette Soubirous lived with her parents, brothers, and sisters in the abandoned jail of the little French village of Lourdes, never dreaming that the very name of Lourdes would one day bring inspiration and hope to millions. Bernadette studied her Catechism, took care of her brothers and sisters, and gathered firewood - and no one knew she would become a saint.One day, as she was gathering wood, Our Lady appeared. Within a few weeks, thousands were kneeling in the field to pray to the Lady who could be seen and heard only by Bernadette.This was the beginning of one of the greatest Marian shrines of modern times and of the miracles with which Our Lady blessed her children.Ages 9-15. From the famous "Vision Books" series of lives of saints for young people, this is the inspiring dramatic account of the colorful and courageous life and death of the martyr, St. Edmund Campion, "hero of God's underground" during the persecutions of the Catholics in England in the 1500s. This 25th volume in the acclaimed "Vision Books" series of saints’ lives for youth 9-15 years old is the story of the saintly Fr. Damien, who in 1872 went to the island of Molokai, where lepers had been exiled to live in miserable surroundings. Damien earned the trust of the lepers, and his appeals for help resonated throughout the world. He spent his life caring for all the needs of the outcast lepers, and even after Damien himself contracted leprosy he carried on working for his “fellow lepers” to the end. Illustrated. This "Vision Book" for youth 9 - 15 years old tells the thrilling story of one of America's greatest missionaries who came down from Canada with explorer Louis Joliet to explore the mighty Mississippi River, the "great river" bordered by Indian tribes who killed white men on sight. Of the few who had dared explore this immense waterway, none had lived to return and report where it emptied. If he could travel to the mouth of the "great river", Fr. Marquette hoped to obtain new lands for France and new souls for Jesus Christ. He braved the dangers of tomahawks and tortures to bring the Word of God to the Indians of the New World. Rapids, floods, Indian superstitions, tribal warfare - these are only a few of the obstacles Father Marquette and Louis Joliet encountered in trying to meet their challenge. Illustrated. 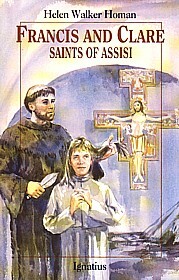 A "Vision Book" about St. Francis and St. Clare, the two very popular saints of Assisi. Helen Homan has captured all the excitement and beauty of the lives of these saints from their childhood growing up together in Assisi to their profound conversion and lifelong influence--indeed centuries-long influence--on the whole world through their radical living of the Gospel and founding of two great religious orders, the Franciscans and the Poor Clares. Combining the stories of Francis and Clare in one volume makes for a book that will be of great interest to both boys and girls of a wide age span. Illustrated. Ages 9-15 This book is from the famous line of "Vision Books" of saints that are one of the most popular and well-told series of stories for young people. This is the inspiring story of Blessed Kateri Tekakwitha, a holy young Indian woman who was converted to Christianity by the French missionaries led by Saint Isaac Joques during the 1600s. In 1946, Francesca Cabrini was canonized as the first saint of the United States. 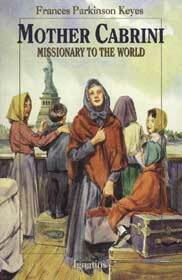 This "Vision Book" for 9 - 15 year olds tells the exciting story of this missionary from Italy who came to America to spread the Faith. She founded a new order nuns, the Missionary Sisters of the Sacred Heart, to teach the Faith and work with the poor in our country. She was a tireless missionary who crossed the ocean 37 times to expand her order across the world to France, England, Spain; in Central and South America; in the United States from coast to coast including New York, New Orleans, Denver, Seattle (where she took the oath of U.S. citizenship) and Chicago, where she died in 1917, a saint of our time. Illustrated. In 1975, Mother Elizabeth Seton was canonized as America's first native-born Roman Catholic saint. This "Vision Book" tells the inspiring true story of the life of Elizabeth Bayley Seton from her childhood in a distinguished New York family to her becoming a sister and foundress of an order of nuns. This volume in the "Vision Books" series of saints for youth combines a world famous Catholic novelist, Louis de Wohl, with one of the most thrilling and dramatic saint's lives in history, St. Joan of Arc. De Wohl uses his famed narrative skill to tell young people about the brave teenage French girl who had visions and led armies in battle, but also about how her entire life testifies to the amazing power of God's grace. It's all here: how Joan, a humble maiden in an insignificant town, was told by St. Michael the Archangel, St. Catherine, and St. Margaret to lead the French in battle against the English; how she finally succeeded in convincing the French of the truth of her mission; how she met with fantastic success but was betrayed, captured, and imprisoned; and finally, how she suffered through a politically motivated trial for heresy and was burned at the stake. St. Thomas More comes to life in this biography from the acclaimed “Vision Books” series of saints for youth 9 - 15 years old. Raised in the London of the late 1400’s, Thomas was a bright student eager for knowledge. When serving as a page for Cardinal Morton, the Archbishop of Canterbury noticed his bright wit and sent him to Oxford. There young Thomas became a scholar and later one of the greatest lawyers in England. Going on to serve his King, he soon became one of Henry VIII's most trusted advisors. But then the unthinkable happened. Helen Walker Homan contributes her third volume to the "Vision Books" series of saints for youth in this story of the life of the greatly beloved St. Anthony of Padua. Mary Fabyan Windeatt presents the powerful story of the famous life and miracles of St. Benedict for the "Vision Book" series of saints for youth. Known as the Father of Western Monasticism, St. Benedict played a major role in the Christinization and civilization of post-Roman Europe in the sixth century. Catherine Beebe presents a dramatic account of the incredible life of St. Dominic in this tenth title in the popular "Vision Books" series of saints for youth 9 - 15 years old. As a young priest, Dominic sat all night at a wooden table in a village tavern. He preached the truths of the Church to an embittered inn-keeper and, in the morning, joyfully received the man again into the faith of his fathers. This was the beginning of the great preaching career of Saint Dominic, the "Athlete of Christ" and founder of the order which bears his name. Saint Dominic led a life of excitement and adventure. As a boy he sold his books to feed the poor and offered himself as ransom for a prisoner. As a young priest he rode with a king's cavalcade to carry a marriage offer to the princess of Denmark from the prince of Castile. But his greatest adventures came when he walked from town to town and preached the word of God and the power of the Holy Rosary prayer. The work of the thousands of Dominican priests and sisters all over the world stands today-seven centuries later-as a living memorial to the sanctity of their founder. Illustrated. For more than a hundred and fifty years the Miraculous Medal has been known and worn by Catholics throughout the world. It has been used and promoted by great saints and Popes as a most powerful sacramental. Less well known is the story of the French Sister to whom the Blessed Virgin manifested the Medal in 1830. This "Vision Book" for 9 - 15 year olds tells the story of Catherine Labouré, a Burgundy farm girl who, after a prophetic dream of St. Vincent de Paul, became a Sister of Charity in Paris and later in Enghien, where she cooked and mended and cared for the inmates of a home for elderly men. To this obscure Sister the Blessed Virgin appeared, made prophecies, and commissioned the making of the Medal which soon came to be known as "miraculous" because of the favors wrought. St. Catherine Labouré lived a life of prayer and service to the poor, and was canonized in 1947. Ages 9-15. This story in the "Vision Books" series of saints for 9 - 15 year olds is aobut Saint Elizabeth of Hungary who spent her life differently than most saints. Instead of living in poverty like St. Francis of Assisi, she lived most of her life in a castle surrounded by incredible wealth. She was born Princess Elizabeth of Hungary, the daughter of King Andrew. By the age of four she was already engaged to be married and was sent far away from her home to live with Louis, her husband-to-be, who was only 10 years old. From the beginning of her life in her new castle, Elizabeth was ridiculed by all of those people who were jealous of her. They noticed that she was always trying to be holy. As she would play games with other children, she would contrive little ways to sneak into the chapel and have a visit with Jesus. Although Elizabeth was a princess, she longed to live the kind of poverty she heard about through the Franciscans. She became a member of the Third Order of St. Francis and she constantly gave her jewels and best clothes to the poor. Sometimes she gave everything away and had nothing nice to wear, but Jesus always provided for her at the last minute. When she emptied the castle store-houses of grain for the poor, Jesus would miraculously fill them up again. Her subjects were never able to grow accustomed to the queen who lived the life of a saint, but they always appreciated her generosity and saw in her such simplicity and holiness. Only four years after her death she was canonized a saint. This story from the popular "Vision Books" series of saints lives for youth 9-15 years old is about the inspiring life of the great missionary to the Far East, St. Francis Xavier. After his wartorn boyhood in Navarre, Francis Xavier went to the University of Paris, determined to have a good time. He was interested in sports and became broadjumping champion of his college, and did not pay much attention to his studies. At first he scoffed at this fellow student, Ignatius Loyola, a former soldier who wanted to win the world for God. But Ignatius showed him that true champions are a far more heroic breed - those who risk their all to win the world for God. Francis joined Ignatius' followers, and became one of the first members of the Society of Jesus. Francis Xavier was selected by Ignatius to do missionary work in India. To all sixteenth-century travelers, a voyage from Portugal to India meant months of deadly peril from storms, pirates, and diseases. But to Father Francis Xavier, it also meant a chance to win the Orient for Jesus Christ. This great saint's eagerness to spread the Word of God involved him with the pearl divers of the Indian coast, the natives of Malaya and the Spice Islands, the cannibals of Morotni and the hostile feudal lords of ancient Japan. This book captures the true spirit of a daring man who braved the many dangers of India and Japan in amazing adventures of courage and faith. This "Vision Book" for youth 9 - 15 years old tells the exciting, dramatic story of St. Ignatius of Loyola and the order he founded, the Society of Jesus. As a young man, Ignatius had dreams of an adventurous life as a soldier. His dreams, however, did not come true the way he had hoped. Seriously wounded in battle, the soldier Ignatius had a profound conversion to Christ during his period of healing and recovery. He abandoned a promising career in the military and dedicated the rest of his life to the service of Christ and the Church. This book tells of his starting one of the most influential orders in the church, and gives a graphic account of his adventures, his many encounters with popes, kings and emperors, and the great work the Jesuits did in spreading the Gospel. Over three hundred years ago, many Frenchmen came to the unknown forests along the St. Lawrence River. Most of them came in search of furs and wealth. But there were some--a handful of Jesuit missionaries--who came not to get, but to give. They wished to give the savage Indians the knowledge of God and of His love for them. One of these missionaries was Isaac Jogues, martyr and Saint. This "Vision Book" tells the story of his dangerous and difficult life among the Indian tribes in their tree-dark country--of his work of conversion, of his efforts to teach the Indians rules of health and to set them free from their superstitious belief in the power of their medicine men. This is the inspiring story of his enslavement by the Mohawks, his daring escape, and finally, his death as a martyr for the Faith. A "Vision Book" containing the enthralling story of the great modern apostle of youth, Saint John Bosco, and his best-loved pupil who became a saint, Dominic Savio. Blessed with tremendous natural and supernatural gifts, including a wonderful sense of humor, Saint John Bosco overcame overwhelming obstacles to help deprived children find a better life. Juggler, magician, acrobat, tailor, teacher and writer--John Bosco became all of these in his efforts to lead boys and girls to God. A prayer was the price of admission to his shows; a friendly contest to match skill or strength was his answer to the hoodlums who laughed at him. As a priest he was known as Don Bosco and built churches and schools. This "Vision Book" for youth tells the beautiful story of American's recently canonized saint and servant of the oppressed, St. Katharine Drexel. Born in 1858 to Francis and Emma Drexel, Katharine grew up in a happy, devout, and wealthy Catholic family in Philadelphia. Her parents were greatly loved and admired by many for their kindness and generosity to the poor and needy. This "Vision Book" for young people 9-15 years old tells the story of one of God's most lovable and loving saints, St. Philip Neri. Despite his wisdom and learning, he was a simple, radiant, childlike soul who never ceased, even in his honored old age, to make jokes, to play with his many pets, to tease, to amuse, to teach the great lesson that it is the joyous heart that wins friends to Christ. A saint who young people are particularly attracted to, St. Philip in turn had a great love for youth. Philip grew up in a very poor family in Florence, and was later taken in by his uncle, a prosperous merchant. Ever searching for a way best to serve God, he abandoned a merchant's career to become a lay apostle. He lived in Rome for many years as a layman, preaching, instructing youth and attending the sick. 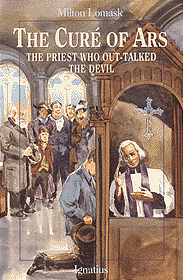 Deciding that he could best help his fellow man as a priest, he then entered the seminary. As a priest, his holiness, joy and zeal soon helped thousands of Romans to live a vibrant Christian life. St. Philip founded a religious congregation, the Oratory, and became the counselor of popes and cardinals, the trusted friend of beggars and outcasts. Like Christ, he was all things to all men, a mighty example of selfless love. Illustrated. Another stirring tale from the "Vision Books" series for youth 9-15 years, this book tells the charming story of Giuseppe Sarto, "the farm boy who became Pope". 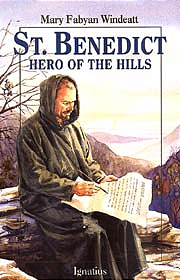 Young readers will be inspired by the life of this holy man--from his youthful days of hard work and prayer to receive the education he needed; to his years as country priest, encouraging his people to holiness; through the steady promotions to pastor, monsignor, bishop, cardinal, and archbishop, which he reluctantly accepted but in which he always became the beloved of those he served; to his days as the Holy Pontiff, Pope Pius X, the only canonized Pope of this century. This simple man who never forgot the poor will always be a timely example of holiness. Born of very humble circumstances, young Giuseppe Sarto had one burning desire while growing up on a farm--to become a priest. But never did he or his generous parents ever dream that he would one day sit in the Chair of St. Peter. This is the inspiring story of the humble "Pope of little children," whose love for Christ and children moved him to change the requirements for First Communion so that young children as early as 7 years old could receive the Holy Eucharist. Illustrated. The story from the "Vision Books" series of the greatly beloved Jean-Marie Vianney, a farm boy born during the French Revolution, who longed to become a priest. But he could not learn Latin, and it seemed as if the humble, lovable, slow-thinking Jean-Marie would never be ordained. He did at last become a priest, and such a holy one that Vianney is invoked as the patron saint and model of parish priests everywhere. To many he is known simply as "the Curé of Ars," the parish priest who devoted his life to the little village of Ars and so successfully led his people to sanctity that he became a prime target of the devil. Illustrated. Ages 9-15. This "Vision Book" for youth tells the exciting inspirational story of the great French saint of charity, St. Vincent de Paul. From his days of youth as a shepherd boy to his slavery in North Africa, his escape to France, his priestly service to the poor and to abandoned children, his founding of both the Vincentian Order and the Daughters of Charity, clashes with the Jansinists and his political adventures at court, this is a dramatic story sure to inspire all readers. 5.25" x 8" Ages 9-15.